I had a wonderful mother. She was an excellent cook, especially when it came to comfort food. One of my favorite things she made was potato soup. The hardest part of making potato soup in my house is the challenge of keeping my husband from eating the raw potatoes. Before you judge……we both grew up eating raw potatoes. As disgusting as that is to some of you, including our children, it’s normal to us. So, with a few unkind words spoken to him, the soup finally gets made. It is a combination of my mother’s recipe and my own touches. It’s rich, thick and so delicious! Melt the butter in a heavy pot. Add the onion and celery and cook until the onion is tender but not brown. Add the potatoes, seasoning and chicken broth. Cook until the potatoes are fork tender (don’t cook too long or they will get mushy). With a potato masher break up the cooked potatoes so you still have big pieces and smaller pieces. Thicken the milk (make sure it is whole milk, the others just don’t have the same results in making it thick and rich) with the flour and add to the potato mixture. Add the cream and coleslaw. Cook for about 10 minutes over medium heat until soup thickens. I freeze the leftovers, if there are any ,to grab as I go out the door to work. I let it sit out all morning to thaw and then microwave for about 4 minutes. It makes a great lunch. Enjoy. It’s the perfect dinner for a cold winter night! 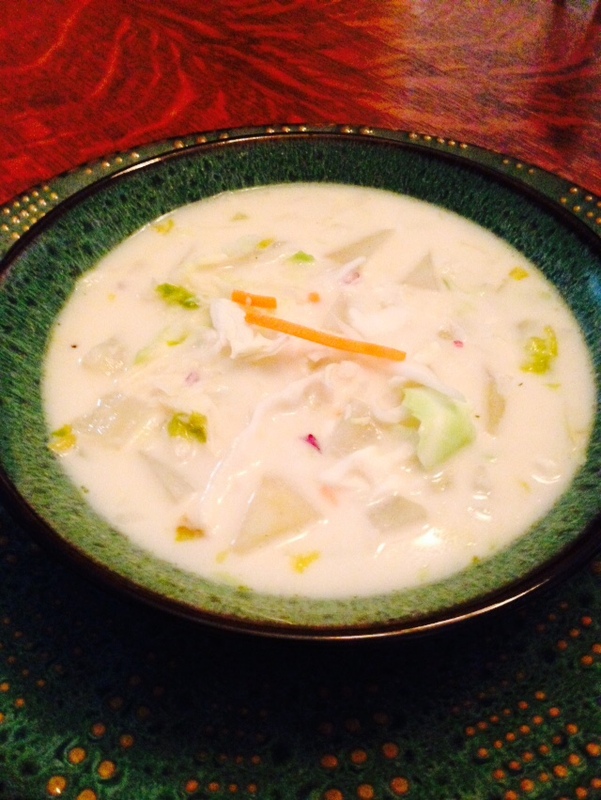 This entry was posted in Home-cooking and tagged cold weather food, comfort food, family dinner, home-cooking, Notes from the teacher's desk, potato soup, soup. Bookmark the permalink.